This free, alive-at-five event offers live music and fun for the whole family with an inflatable Pirate Ship for children, arts and crafts, live music, Uptown restaurant food, and adult beverages for those 21 and older. 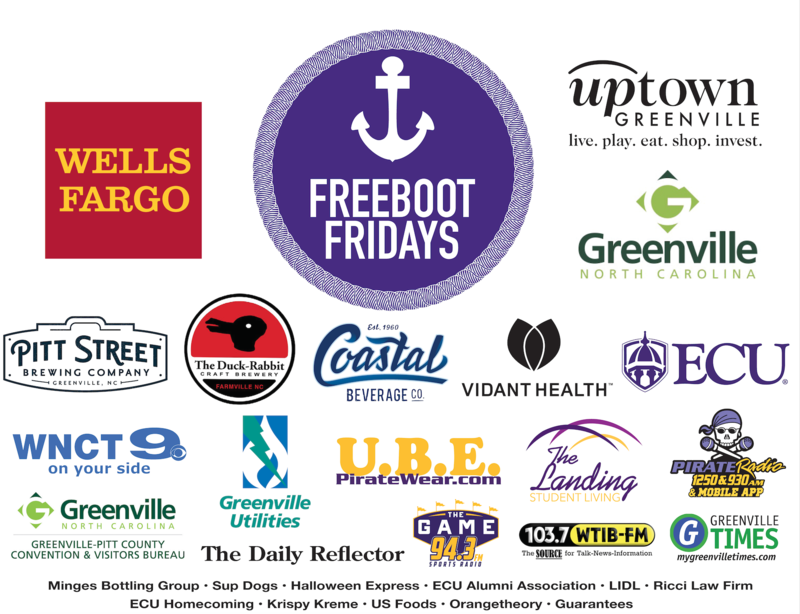 Head to Five Points Plaza (5th and Evans) in the Uptown district for Freeboot Friday held from 5-8pm on ECU Home Football Fridays. Save the Dates for 2018! –August 31, September 7, September 28, October 12, October 19, and November 2. Need a ride the day of the game? Climb aboard the Sup Dogs Game Day Shuttle. Find the details and route information here! If you are interested in becoming a sponsor, hosting a non-profit booth, or becoming a vendor at the 2018 season of Freeboot Friday, please see the appropriate form below, or call the Uptown Greenville office at (252) 561-8400!